Nothing will make your centerpiece more intriguing and lovely than when you have more than one color. When you combine colors, you have so many options. Of course if you are trying to coordinate for a given theme or occasion, then it makes sense to use those colors. For a wedding, it would be practical to use the colors that the wedding party selected. You can also be very unique and creative when you are combining colors. Sometimes, a subtle color combined with one or more bold colors can really be eye catching. If you aren’t sure what to go with, try it! There is nothing wrong with seeing where it leads. You can also go with some tried and true color schemes that you already know work well with each other! Sometimes, simple is all you need and it can still have some elegance to offer for your centerpiece. You can’t go wrong with the combination of black and white. If you are sticking with two colors, you want them to be different enough that they won’t melt into each other. They will offer vibrancy as a pair and yet you can still pick out the individual colors with ease. There are seasonal color schemes that also work very well with each other. In the spring, light hues work well. For the winter, bolder colors are a great option. In the spring and fall, the mix of red with yellow, orange, or brown work very nicely. Think about holiday type color schemes too. For example, around the 4th of July there is the option of red, white, and blue. For Christmas, green and red seem to be a very common theme. If you are providing the centerpiece for an anniversary, silver or gold work very nicely with other colors to help enhance the significance of the special occasion. If you are still not confident in your selection process, use a color wheel to help you. It allows you to see the various colors and what works well with others. It can give you some new perceptions on the process and prevent you from going with something too conservative when you are interested in creating lovely looking centerpieces. Have fun experimenting and expressing your creative side by combining colors for your centerpiece. Knowing what colors can work well with others will make such a project more fun and less work. The more you do so, the more you will feel confident about what you offer. Be ready for lots of great compliments to be coming your direction too! Water beads are these perfect little soil crystals that not only keep your plants hydrated but can be used for most any theme. Whether it’s for a wedding, party or that you simply want to make your home look stunning with a themed idea, water beads help any decoration look beautiful. 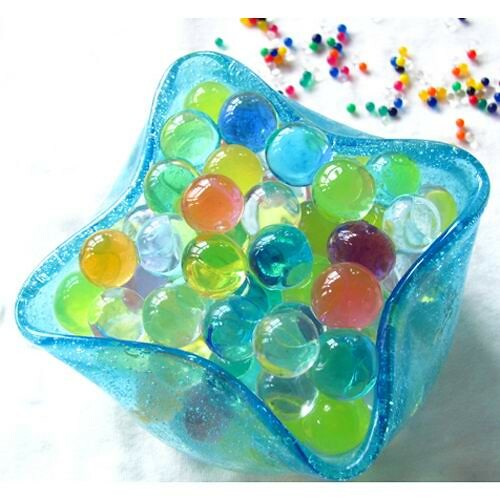 For instance, if you have a home near the water and love a nautical theme, you can get water beads in a variety of colors. Imagine how pretty blue, white or teal water beads will look in your vases. The red and green water beads are an excellent choice for your Christmas ideas and there are a variety of colors available that are perfect for parties and events. The best thing is that the water beads last for quite a while. Once you use them you can expect them to last about a couple of years. If they are stored after all of the water is removed and kept in an airtight container you can get much longer; up to a few years. That means you can use the ones you want during holidays and show off your decorating skills with themed ideas throughout the rest of the year. Your guests will love how beautiful your arrangements look and you’ll love how easy it is to create. Not only are these clean and easy to use but they are perfect in any environment. When you’re ready to create an elegant and impeccable look to your home or event just contact us and we can help you find the right colors and ideas for your creation. With Halloween just behind us, many families are gearing up for the Holiday Season. Thanksgiving, Christmas, and New Years are all times when families come together. This means special decorations with the proper color themes and images. Centerpiece decorations can be the perfect way to add a little color and festivity to your home. With four holidays right in a row it is important to be able to make your centerpieces match each theme. You will also need several pieces, one for the main table, one for the kids table and perhaps a few decorative pieces around the house –like on the mantle, coffee, sofa and side tables. With several major holidays falling so close together it can be important to find ways to get all the way through with low cost and less work. Halloween and Thanks giving both fall in autumn. Halloween of course has a lot of significant color themes like black, orange and purple. Fall harvest is the big theme for both holidays. So your center piece should have lots of reds, browns, oranges and yellows in it. Moving into Christmas where red and green are the big colors but frequently blues and white are big symbols of winter. Finally with the New Year gold, silver and blues are always big color choices along with blacks left over from Halloween. Of course the main table is not the only place for a centerpiece. Kids that often get toted of their own table like to feel like they are still a part of the festivities. A special centerpiece for the kids table can be a nice touch – one with lots of holiday symbols can make it fun and yet still appealing for them. Mantle pieces are a great way to add a little flare to your home with a beautiful flower arrangement or candle set. With the right colors it will light up your home perfectly. Finally wonder through and count how many tables you have in your home. Coffee tables, sofa tables and side tables are all wonderful spots for small pieces to keep the theme running and still be subtle enough and not too gaudy. All these pieces can be done inexpensively with a few glass vases, some candles and different colors of water beads. Your reds, oranges and yellows can be used over and over to carry Halloween into Thanksgiving. Rearrange your greenery with different reds and green beads for Christmas. Cut down on your work for New Years and use clear, white and blue for both holidays. Crystal Water Beads will hold water for up to two weeks so you won’t have to worry about keeping your plants healthy. These inexpensive and simple tools can keep your home looking festive and bright through the entire holiday season.